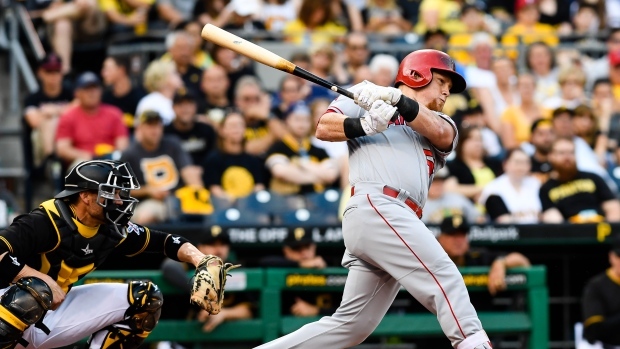 PITTSBURGH — It seemed Angels pitcher Jered Weaver might be headed for another long night when he gave up back-to-back home runs to begin the second inning. Just as quickly, Weaver righted himself and did not give up another run. He wound up pitching six innings to lead Los Angeles over the Pittsburgh Pirates 9-2 on Friday night. Weaver (5-4) allowed six hits, struck out five and walked one, giving up consecutive homers to Starling Marte and Jung Ho Kang. The 33-year-old right-hander Weaver had been 1-4 with a 6.43 ERA in his previous six starts. "He has certainly grown as a pitcher over his career, but he's always been good at reading swings and making adjustments, even when he first came up," Angels manager Mike Scioscia said. "He did that tonight. That team over there is a really good offensive club. After he missed his spots in the second inning, he got back on board and made pitches." Cole Calhoun, Johnny Giavotella, Yunel Escobar, Mike Trout, Carlos Perez and Shane Robinson each had two of the Angels' 14 hits. Los Angeles scored in each of the first four innings. "Getting the early runs helped," Weaver said. "If I'd given up those home runs and we're behind 2-0, then maybe things are different because I wouldn't have been to keep attacking the strike zone. It's always good to have an early lead." Francisco Liriano (4-5) gave up seven runs — six earned — 10 hits and four walks in 3 1/3 innings. He has lost four times in five starts, walking 19 in that span. "I'm going through a tough time right now," Liriano said. "I'm not executing the pitch and getting behind in the count. I don't know. I have to keep working, keep fighting and find a way to get better." Pittsburgh has struck out 44 times in losing four straight games. Trout hit an RBI single in a three-run first capped by Giavotella's two-run single, and Calhoun's RBI single made it 4-0 in the second. After the Pirates closed to 4-2, Gregorio Petit hit an RBI double in the third and scored on Robinson's single. Calhoun homered in the fifth for a 7-2 lead, and Escobar added a two-run single in the seventh off Wilfredo Boscan. Marte had three hits and Kang added two. Right-hander Tim Lincecum is scheduled to make his second start for the Angels' Triple-A Salt Lake farm club Tuesday. Scioscia said it was too soon to tell whether the two-time NL Cy Young Award winner might then be added to the major league rotation. This is just the Angels' second visit to Pittsburgh since interleague play began in 1997. They played a three-game series at PNC Park from June 15-17, 2004. Angels: SS Andrelton Simmons (torn left thumb ligament) is working out with Class A Inland Empire and could begin an injury rehabilitation assignment in the next few days. . LHP Tyler Skaggs (strained left biceps) pitched four innings Friday at extended spring training in Mesa, Arizona. . Escobar (sore left wrist) returned after missing the previous three games. Pirates: C Francisco Cervelli (bruised right foot) and SS Jordy Mercer (bruised left elbow) did not play after getting hit by pitches in Thursday night's game at Miami. X-rays on both were negative. . CF Andrew McCutchen (inflamed right thumb) was back in the lineup, a day after leaving the game against the Marlins. . LF Gregory Polanco (sore left foot) returned to the starting lineup after sitting out Wednesday's night game at Miami and being limited to a pinch-hitting appearance Thursday night. . RHP Arqimedes Caminero (strained right quadriceps) began a rehab assignment Friday with Triple-A Indianapolis. Angels: RHP Jhoulys Chacin (1-1, 3.42) will start in place of an ill Nick Tropeano after being originally scheduled to pitch Sunday. It will be Chacin's fifth start since the Angels acquired him May 11 from Atlanta. Pirates: LHP Jeff Locke (4-3, 4.33) has won his last three starts, including pitching his first career shutout in his previous outing, a three-hitter at Miami on Monday.